For the Milanese ruler, see Luchino Visconti (died 1349). 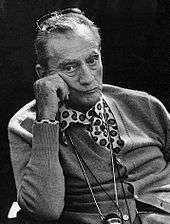 Luchino Visconti di Modrone, Count of Lonate Pozzolo (2 November 1906 – 17 March 1976), was an Italian theatre, opera and cinema director, as well as a screenwriter. He is best known for his films The Leopard (1963) and Death in Venice (1971). Luchino Visconti was born into a prominent noble family in Milan, one of seven children of Giuseppe Visconti di Modrone, Duke of Grazzano Visconti and Count of Lonate Pozzolo, and his wife Carla (née Erba, heiress to Erba Pharmaceuticals). He was formally known as Count don Luchino Visconti di Modrone, and his family is a branch of the House of Visconti. In his early years, he was exposed to art, music and theatre: he studied cello with the Italian cellist and composer Lorenzo de Paolis (1890–1965) and met the composer Giacomo Puccini, the conductor Arturo Toscanini and the writer Gabriele D'Annunzio. During World War II, Visconti joined the Italian Communist Party. Visconti made no secret of his homosexuality. His last partner was the Austrian actor Helmut Berger, who played Martin in Visconti's film The Damned. Berger also appeared in Visconti's Ludwig in 1972 and Conversation Piece in 1974, along with Burt Lancaster. Other lovers included Franco Zeffirelli, who also worked as part of the crew in production design, as assistant director, and other roles in a number of Visconti's films, operas, and theatrical productions. Visconti suffered a stroke in 1972, but continued to smoke heavily. He died in Rome of another stroke at the age of 69. There is a museum dedicated to the director's work in Ischia. He began his filmmaking career as an assistant director on Jean Renoir's Toni (1935) and Partie de campagne (1936), thanks to the intercession of their common friend, Coco Chanel. After a short tour of the United States, where he visited Hollywood, he returned to Italy to be Renoir's assistant again, this time for La Tosca (1939), a production that was interrupted and later completed by German director Karl Koch because of World War II. Together with Roberto Rossellini, Visconti joined the salotto of Vittorio Mussolini (the son of Benito, who was then the national arbitrator for cinema and other arts). Here he presumably also met Federico Fellini. With Gianni Puccini, Antonio Pietrangeli and Giuseppe De Santis, he wrote the screenplay for his first film as director: Ossessione (Obsession, 1943), the first neorealist movie and an unofficial adaptation of the novel The Postman Always Rings Twice. In 1948, he wrote and directed La terra trema (The Earth Trembles), based on the novel I Malavoglia by Giovanni Verga. In the book by Silvia Iannello, Le immagini e le parole dei Malavoglia, the author selects some passages of the Verga novel, adds original comments and Acitrezza's photographic images, and devotes a chapter to the origins, remarks and frames taken from the movie. Visconti continued working throughout the 1950s, although he veered away from the neorealist path with his 1954 film, Senso, shot in colour. Based on the novella by Camillo Boito, it is set in Austrian-occupied Venice in 1866. In this film, Visconti combines realism and romanticism as a way to break away from neorealism. However, as one biographer notes, "Visconti without neorealism is like Lang without expressionism and Eisenstein without formalism". He describes the film as the "most Viscontian" of all Visconti's films. Visconti returned to neorealism once more with Rocco e i suoi fratelli (Rocco and His Brothers, 1960), the story of Southern Italians who migrate to Milan hoping to find financial stability. In 1961, he was a member of the jury at the 2nd Moscow International Film Festival. Throughout the 1960s, Visconti's films became more personal. Il Gattopardo (The Leopard, 1963), is based on Lampedusa's novel of the same name about the decline of the Sicilian aristocracy at the time of the Risorgimento. It starred American actor Burt Lancaster in the role of Prince Don Fabrizio. This film was distributed in America and Britain by Twentieth-Century Fox, which deleted important scenes. Visconti repudiated the Twentieth-Century Fox version. It was not until The Damned (1969) that Visconti received a nomination for an Academy Award, for "Best Screenplay". The film, one of Visconti's best-known works, concerns a German industrialist's family which slowly begins to disintegrate during the Nazi consolidation of power in the 30s. Its decadence and lavish beauty are characteristic of Visconti's aesthetic. Visconti's final film was The Innocent (1976), in which he returns to his recurring interest in infidelity and betrayal. Visconti was also a celebrated theatre and opera director. During the years 1946 to 1960 he directed many performances of the Rina Morelli-Paolo Stoppa Company with actor Vittorio Gassman as well as many celebrated productions of operas. Visconti's love of opera is evident in the 1954 Senso, where the beginning of the film shows scenes from the fourth act of Il trovatore, which were filmed at the Teatro La Fenice in Venice. Beginning when he directed a production at Milan's Teatro alla Scala of La vestale in December 1954, his career included a famous revival of La traviata at La Scala in 1955 with Maria Callas and an equally famous Anna Bolena (also at La Scala) in 1957 with Callas. A significant 1958 Royal Opera House (London) production of Verdi's five-act Italian version of Don Carlos (with Jon Vickers) followed, along with a Macbeth in Spoleto in 1958 and a famous black-and-white Il trovatore with scenery and costumes by Filippo Sanjust at the Royal Opera House in 1964. In 1966 Visconti's luscious Falstaff for the Vienna State Opera conducted by Leonard Bernstein was critically acclaimed. On the other hand, his austere 1969 Simon Boccanegra with the singers clothed in geometrical costumes provoked controversy. 1958 Macbeth, Verdi Spoleto Festival, Italy William Chapman & Dino Dondi; Ferruccio Mazzoli & Ugo Trama;Shakeh Vartenissian. 1959 Il duca d'Alba, Donizetti Spoleto Festival Luigi Quilico, Wladimiro Ganzarolli, Franco Ventriglia, Renato Cioni, Ivana Tosini. 1961 Salome, Richard Strauss Spoleto Festival George Shirley, Lili Chookasian, Margarei Tynes, Robert Anderson, Paul Arnold. Franco Mannino (1963) Teatro Massimo, Palermo Ugo Benelli, Clara Petrella, Gianna Galli, Antonio Annaloro, Antonio Boyer. Wolfgang Amadeus Mozart Teatro dell'Opera di Roma Rome Rolando Panerai, Uva Ligabue, Ugo Trama, Martella Adani, Stefania Malagù. 1965 Don Carlo, Verdi Rome Opera Cesare Siepi, Gianfranco Cecchele, Kostas Paskalis, Martti Talvela, Suzanne Sarroca, Mirella Boyer. Conducted by Carlo Maria Giulini. 1966 Falstaff, Verdi Staatsoper, Vienna Dietrich Fischer-Dieskau, Rolando Panerai, Murray Dickie, Erich Kunz, Ilva Ligabue, Regina Resnik. 1966 Der Rosenkavalier, Strauss Royal Opera House, London Sena Jurinac, Josephine Veasey, Michael Langdon. 1967 La traviata, Verdi Royal Opera House, London Mirella Freni, Renato Cioni, Piero Cappuccilli. Giacomo Puccini Spoleto Festival Nancy Shade, Harry Theyard, Angelo Romero, Carlo Del Bosco. ↑ "2nd Moscow International Film Festival (1961)". MIFF. Retrieved 4 November 2012. Visconti bibliography, University of California Library, Berkeley. Retrieved 7 November 2011. Wikimedia Commons has media related to Luchino Visconti. Hutchison, Alexander, "Luchino Visconti’s Death in Venice", Literature/Film Quarterly, v. 2, 1974. (In-Depth Analysis of Death in Venice).